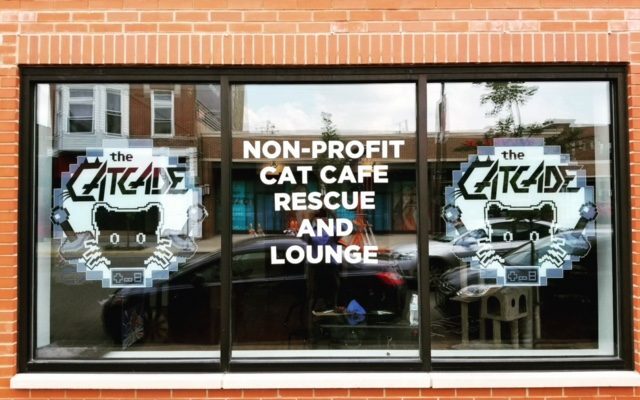 When is a cat cafe not a cat cafe? When it’s a Catcade! 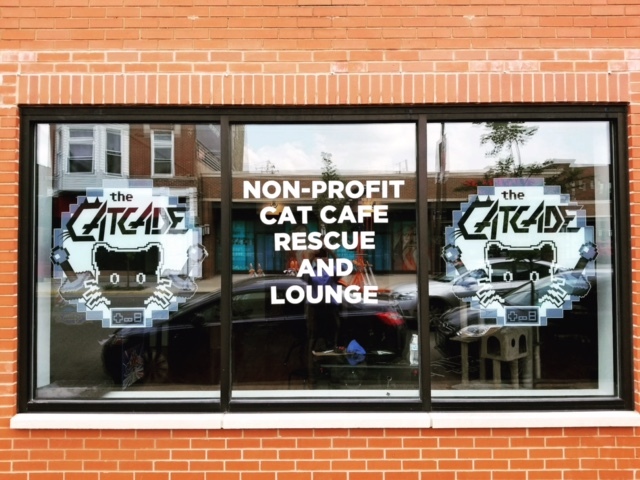 Opened in Chicago last week, The Catcade brings together cats, arcade games, and soda pop into a winning variation on the cat cafe. 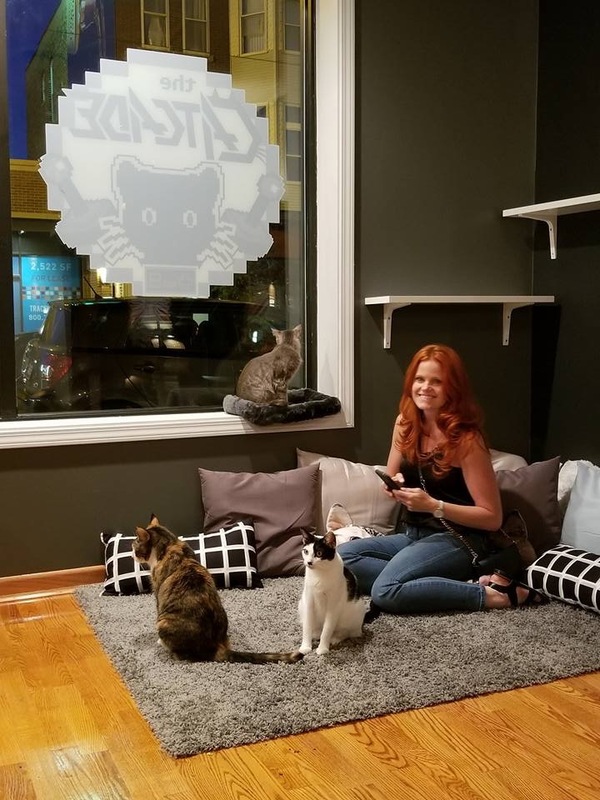 Catcade is the dream of Christopher Gutierrez and Michelle “Shelly” Casey, who had the brilliant idea to marry their twin passions of cat rescue and eighties gaming into a cat lounge. As fan Adam states, “I can’t think of a reason nobody else tried this before. It’s cats, video games, and beverages. What more do you need from life?” Word. And after just one week, the lounge looks like a winner for all, especially the cats. Even before they officially opened, the storefront in Chicago’s Lakeview neighborhood has had people pressing against the glass in anticipation. 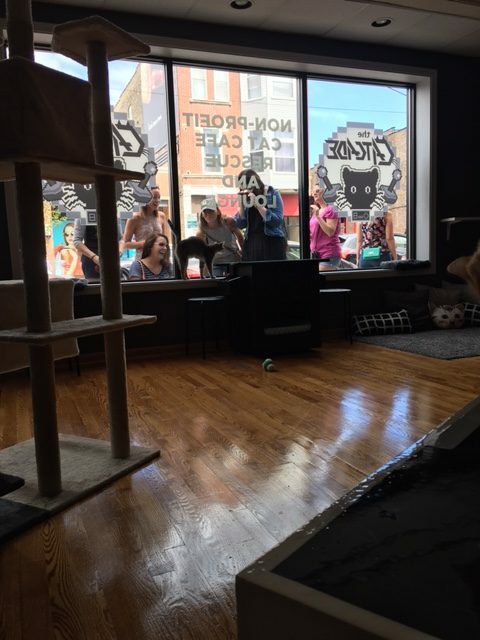 Eager cat nerds have been pressed against CatCade’s window in excitement. 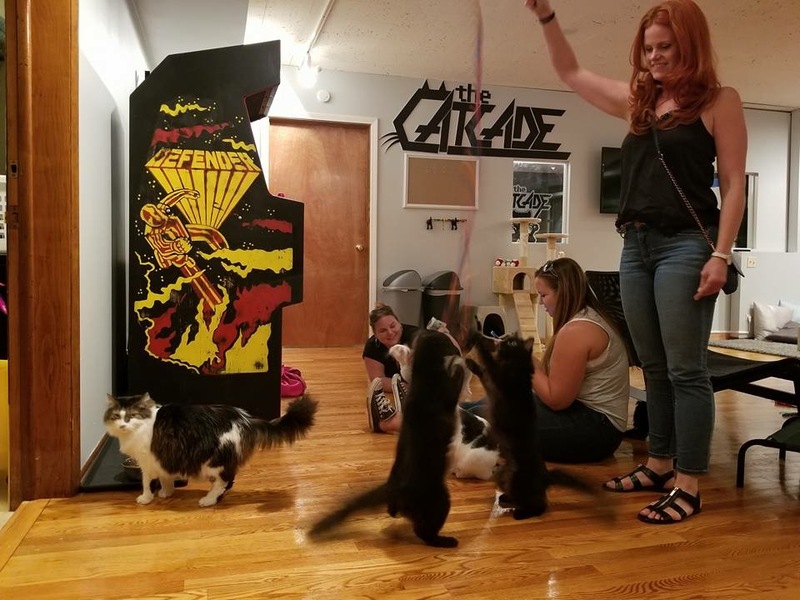 So Ms. Pac-Man walks into a cat cafe, and brings Super Mario, Galaga, and other classic eighties games. Add rescue cats. Voilå! The Catcade is born. Founder Christopher Guitterez’s skills in arcade game restoration provide a top-flight menu of classics from the golden age of gaming. You can enjoy Ms. Pac-Man (both fast traditional versions) and a few multicade arcade games which are always available on free play, as well as video game consoles. Note that the sound is lowered on games to maintain a calm and living-room like environment. 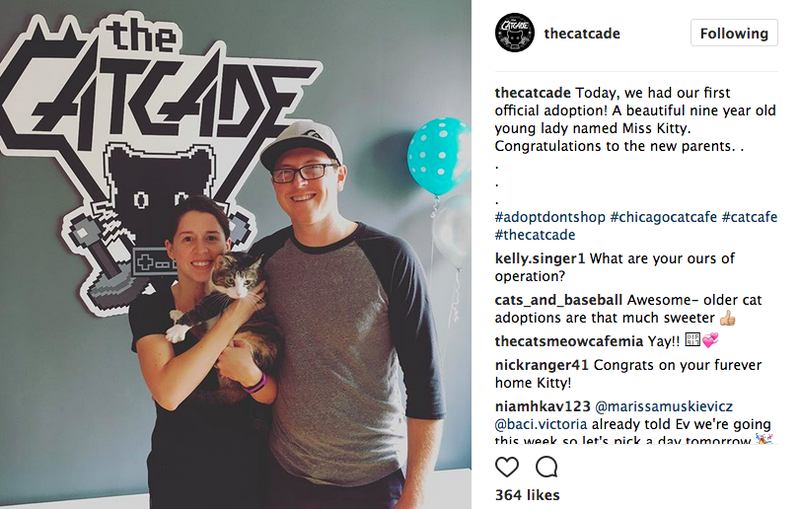 Catcade is teaming up with the rescue group Felines and Canines to help match homeless cats with forever homes. There are approximately fifteen cats in the lounge to mingle with and get to know. Naturally, all the cats are spayed, neutered, microchipped and ready to be adopted. So if you want to play Super Mario and find a furever friend, this is the place to be. Within a few days of opening, two lucky felines have already found families, including the nine year old Miss Kitty. Within walking distance to the Belmont Redline stop in the Lakeview neighborhood, the lounge promises to be popular with out of town visitors and locals alike. Reservations are highly recommended, though walk-ins are welcome if space allows. Expert tip: make a reservation, especially for weekends. The $15 entry fee is an absolute bargain in Chicago, and gets you a beverage, unlimited free arcade games, and “all the head boops you can handle.” There is also free WiFi if you’d like to come in to study or work. We know what you’re thinking: this would be a great place to bring the kiddos and share your youthful obsessions. Yes, but be aware that there limitations and children under seven are not permitted. One of our favorite things about cat cafes is all the cool cat merchandise. Of course we’re game for all things cat, but we find the distinctive creative expression of local designers irresistible. 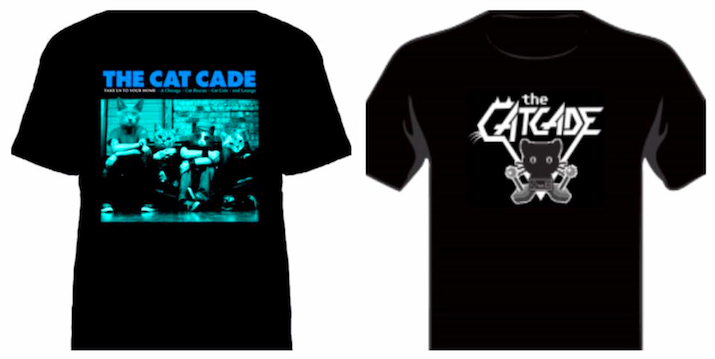 Catcade’s design are particularly awesome; you’ll want to order of one of their t-shirts (or other merch). For the reasonable cost of twenty bucks, you can have a great t-shirt, represent a Chicago cat rescue lounge , and help save more cats. The lounge is a 501(c)3 dedicated to helping save kitties from high kill shelters by finding them permanent homes. If you’d like to further support their efforts, consider purchasing something off of their Amazon wish list, which has items for as little as three dollars.